This is a really yummy little vegetarian dish that serves well as a starter, or as part of a buffet. I've made it three times in a short while, one of those our big 13-course dinner, since discovering them on one of my favorite food blogs, Smitten Kitchen. It's been really well received each time, and my baby loves it too. (The toddler, not so much.) Keeping the baby in mind, I haven't added any extra salt to these. You can, of course, but the feta is so salty you really don't need to. I also add a little pinch of ancho chili - not enough to add any real heat, but a slight smokiness. And everything can be prepared well in advance. The fritters heat up well in the oven, so you can make them ahead of time, if you want to. In a large bowl, grate the lemon zest and the garlic - a Microplane comes in handy here. Add the egg and whisk. When the cauliflower is cooked, rinse it with cold water and let it dry on a towel, then add to the bowl. Mash with a potato masher until it's all well-mixed. Crumble in the feta. Add flour, baking soda and chili, and mix into a uniform batter. Fry in a little bit of olive oil until lightly golden on both sides. To serve, stir together yogurt and cumin, and pick the seeds from the pomegranate. Serve with a dollop of yogurt and a sprinkle of pomegranate. Oh my, these look absolutely amazing! I must make them soon. These were amazing! 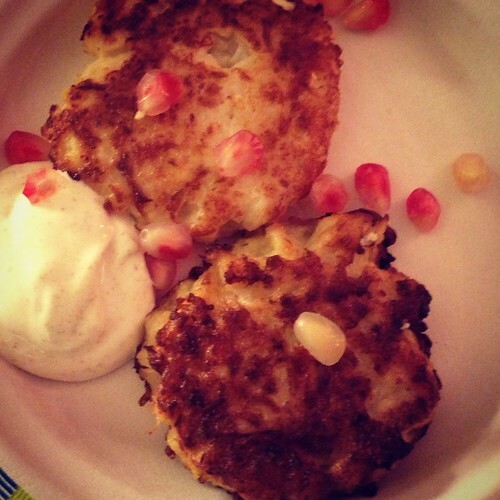 Love the combination of cauliflower, feta and pomegranate! You are on it, Anne. Just read an article about food trends in Huffington Post and cauliflower is trendy!! I will definitely make these little fritters! They look great! Happy New year!